Since 1920 artist, photographer, and filmmaker Ella Bergmann-Michel lived and worked at the 'Schmelz', an old paint mill near Frankfurt on Main. With guests such as Kurt Schwitters and Laszlo Moholy-Nagy the house became an important locale for modern artists. Between 1931 and 1933 she made five documentary films that constitute a rare example of socially involved and equally artistic film. 'In a cultural union 'bund das neue frankfurt' (alliance the new frankfurt), with a journal by the same name, there had also been, among other groups, one founded for the distribution and creation of good film. It was joined to the 'Liga fur unabhangigen Film' (league of independent film). There were to be critical lectures and the production of our own informative films. This group was led by three people, one of them was I. One day the architect Mart Stam proposed to me to make a film on the Budge-home for the aged built by him, Moser and Kramer. Unfortunately I was not in the possession of a camera of my own. There was a photographer who had a camera with a hand crank. Based on a script written by me and Mart Stam I directed the film. This building had light and sun in large pleasant rooms. It had been finished in 1929 and was, to Frankfurt standards, very modern offering all amenities to old people. Thus the home for the aged was filmed and the well being of the old was shown. The ground plan of the building as well as the variability of some rooms was animated through special effects using drawings. After the first showing in the program of a matinee at the 'bund das neue frankfurt' along with the films Die neue Wohnung (The New Apartment) by Hans Richter and Abbruch und Aufbau (Tearing Down and Building Up) by Wilfried Basse the Frankfurter Zeitung observed at the time that it had been a successful demonstration of cultural film. Cinemas in Frankfurt and Berlin took over the film as a supporting feature. Film distributor was the 'bund das neue frankfurt'. German and foreign construction companies bought copies. All Edition Filmmuseum DVDs are strictly for private home use. Please contact Osterreichisches Filmmuseum directly for screening rights. Since 1920 artist, photographer, and filmmaker Ella Bergmann-Michel lived and worked at the 'Schmelz', an old paint mill near Frankfurt on Main. With guests such as Kurt Schwitters and Laszlo Moholy-Nagy the house became an important locale for modern artists. Between 1931 and 1933 she made five documentary films that constitute a rare example of socially involved and equally artistic film. All Edition Filmmuseum DVDs are strictly for private home use. Please contact Osterreichisches Filmmuseum directly for screening rights. 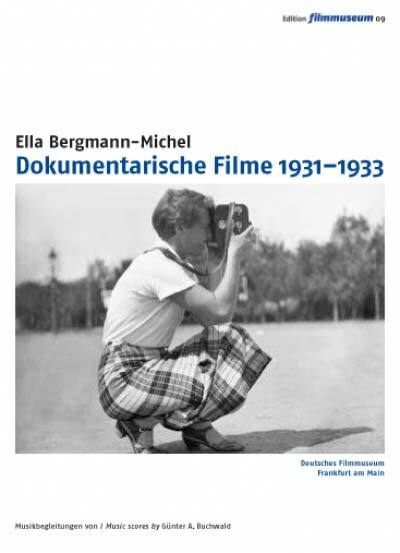 20 page booklet with texts on Ella Bergmann-Michel.